Unryu Valley in Winter (冬の雲竜渓谷) is one of the popular spot in Nikko. 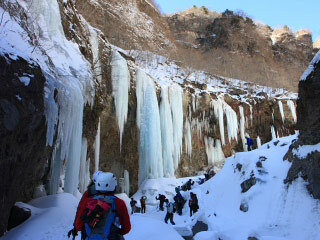 From the end of January to the mid Februrary, Unryu Valley has a great frozen waterfalls and giant icicles. It is one of the best plains of silvery white. Need complete winter climbing suits and shoes. It need also the climbing spikes, helmet and stocks. Don't visit here alone. Travel with a guide or some one who had been Unryu valley. 1. use local bus or taxi to Takio Shrine. Unryu Valley is located on the eastern side of Mt. Nyohou. It is a small valley with a great waterfalls. In winter, entire site will be frozen up and change the icy wanderland.